"Over 90 species of trees populate this placid campus on the edge of Grand Rapids, Michigan. A solid liberal arts curriculum includes specialized programs required each year, beginning with "Inquiry and Expression" during freshmen year and ending with "Global Perspectives" senior year. We've never taken these classes, but they certainly sound intellectually stimulating." What are the top 3 reasons someone should attend Aquinas College? There is only about 2000 students attending Aquinas, so you see familiar faces every day and get to know nearly everyone. 2. The class sizes are small. 3. Aquinas is located in a great college town, Grand Rapids, Michigan. What is a typical Aquinas College student like? Describe the type of person that should attend Aquinas College. When the first universities were established in the Middle Ages, they were the product of Catholic imagination and the desire to communicate the truths of the faith in a systematic, universal way. Like the great cathedrals that preceded them, the early Catholic universities were an outpouring of creative energy at the service of the Church during a critical time in the Church's history. We are in our own time at a crossroads. The need for a robust, intelligent, faithful Catholic education is imperative. 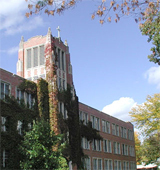 Aquinas College in Grand Rapids, Michigan , is privileged to bear the name of one of the greatest Catholic minds in history, St. Thomas Aquinas; and we are dedicated to the Church's mission of imparting to others the beauty and majesty of the Catholic faith through the nearly eight hundred year old tradition of Dominican prayer, study, and teaching. This year Aquinas College celebrates its 50th year of educating students in the liberal arts, teaching, nursing, and business by compelling them to think beyond the textbook and challenge the basic assumptions of our culture. Much like the medieval university, Aquinas College finds itself happily at the crossroad where culture and faith meet. Our plans for the future include residential life, master's degrees in nursing science and education, and a flourishing of other programs that will enable our students to be salt and light for a world looking for true witnesses to the hope that is in Christ. We welcome you to our campus in Grand Rapids and invite you to be a part of Aquinas College's commitment to this great endeavor. What are the top 3 things that students do for fun at Aquinas College? 31% of students received Pell Grants, which are provided by the U.S. government to students from middle and lower income families. It gives you an idea of a school’s socio-economic diversity. Campus housing is available for undergraduates. Housing deposit : $100.00. Housing deposit due : Aug 15. Freshman allowed to have car. No pets. 71% of students live on-campus. 87% of freshman live on-campus. A program that focuses on the design of educational services for children or adults with orthopedic and other health impairments which adversely affect their educational performance and that may prepare individuals to teach such students. Includes instruction in identifying physically disabled students, developing individual education plans, teaching and supervising students with orthopedic and other health impairments, counseling, and applicable laws and policies. A program that prepares individuals for employment in health and fitness clubs, wellness centers, public and private recreation facilities, hospitals and corporate fitness programs where they will perform a variety of instructional and administrative duties. Includes instruction in human anatomy and physiology, fitness techniques, exercise science, personal training, nutrition, and customer service. 60% of students graduated in the top half of their class. 48% of students graduated in the top quarter of their class. The average student pays $16,581 for tuition, fees, and other expenses, after grants and scholarships. Total stated tuition is $26,280, in-state and on-campus, before financial aid. Learn more about financial aid at http://www.aquinas.edu/financialaid. Estimate the net price for you at http://www.aquinas.edu/undergraduate/cost_calculator.html. 59% of students graduated in six years. 76% of full time students continued studying at this school after freshman year. Aquinas College participates in the NAIA Division II for college athletics. Want more info about Aquinas College? Get free advice from education experts and Noodle community members. How important are SAT scores and GPA to Aquinas College? According to the admissions section of Aquinas College's Noodle profile, factors considered "Very Important" by the Admissions Office include standardized test scores and GPA.